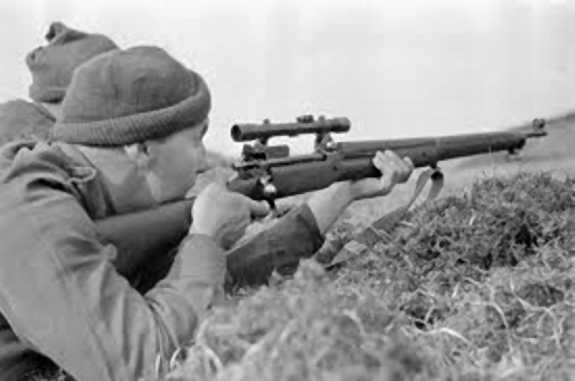 Out of all the rifles I have upgraded into Sniper rifles this rifle was the most difficult to decide as to the best approach with regards to a suitable scope. Accumount manufacture a replica set of rings for the P14/P17 but finding a suitable scope for these rings is problematic. The original Aldis scope is unsuitable for this project as they are rare, expensive and increasingly fragile. The Accumount mounts are continuous rings and not of the modern split type that most shooters are accustomed too and secondly there is no adjustment for windage in the rings, therefore your scope choice is severely limited. The best solution therefore was to fit a Winchester A5 which was technically correct as it was fitted to the US P17’s. As P14’s are old rifles, this particular rifle was fitted with a new barrel and bedded. Replica scope blocks where sourced from the US and aligned with the bore. Whilst magnification is limited on these old scopes and they have to be put back into battery manually, the resulting combination produces a very accurate rifle.